Outside, it features an elegant red canvas, you want to slip inside. Inside, it’s like membranes, we follow them towards the centre, at the heart a small, intimate track… Inside, it breathes, it’s a double bass, a man, or a woman. And then we hear footsteps and we see paws: a horse lives here. 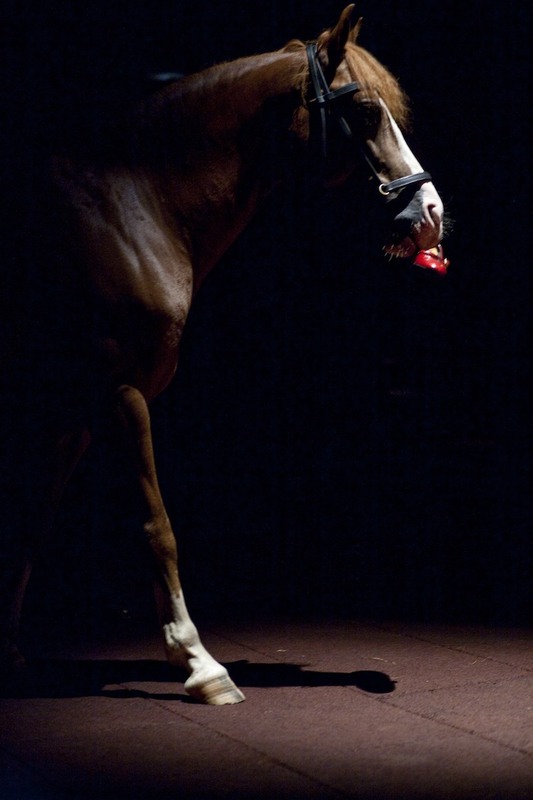 He starts the ball, the musician grabs his gallop, and the man asks him to dance. 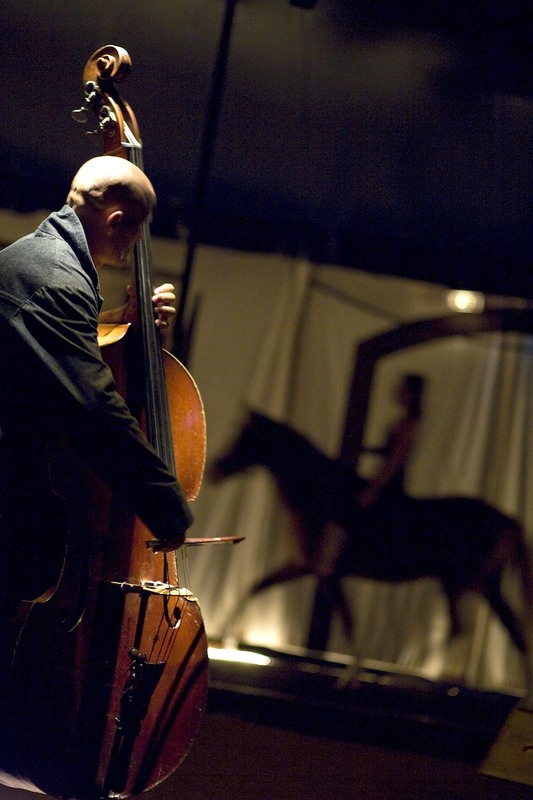 They all jump in the imbalance, in the belly of this double bass, in the heart of this horse. They seek with their arms, a toe, they thrive to make a place. The place for a jump, a dance, a sound, a pitch-up. They seek each other, follow each other, guide themselves without knowing what the carrier knows, nor what the jumper finds. Without knowing if it is necessary to stand up, to be tamed, to be together. « Le sort du dedans » is an introspective performance, sublime by his efficacity and originality […] A poetic fantasy to see and see again with family. 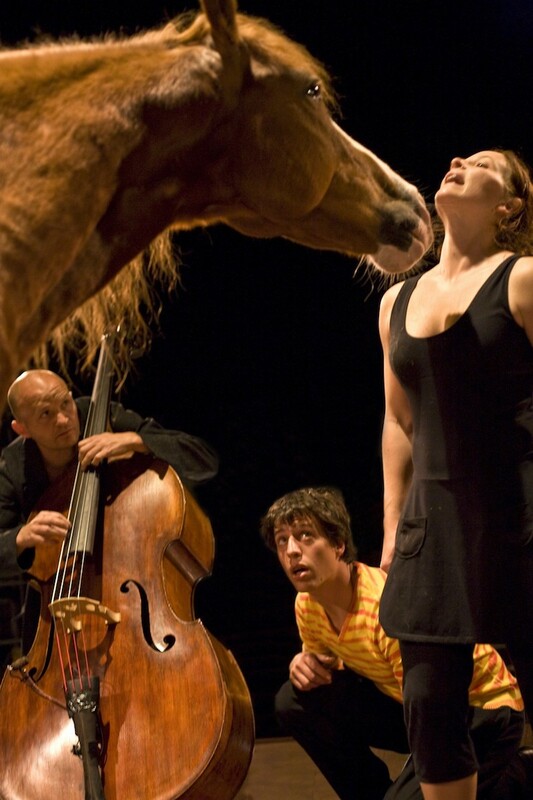 To them, horse is a character who dialogue with the other actors and who let them exist. Never over representing or blustering, without any fuss everything is settled rightly: the voice, the note, the gesture, the choreography and the juggling movement, the majestic lift, the force of the artist and the beauty of the clown. What a bright circus. A universe of distracted objects, circumvented bodies, virtual unfinished gestures, poetically strong, lucidly absurd. Un aire magico te llena los pulmones. Sientes que eso que estas viviendo solo es posible ahí dentro, en ese momento y en ese instante. 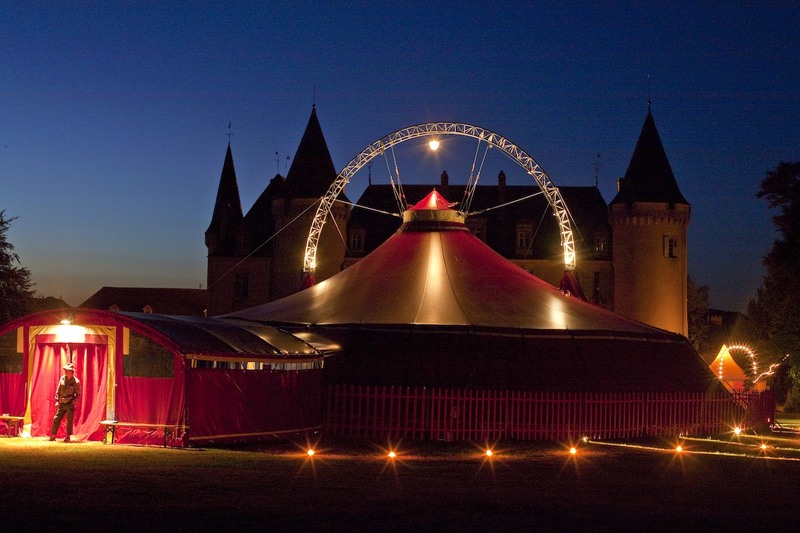 CO-PRODUCTIONS: Tours – Scène Conventionnée Auch Gers Midi-Pyrénées, Le Sirque – Pôle cirque de Nexon en Limousin, Centre Culturel Agora -cène conventionnée de Boulazac, Le Festival La Strada de Graz en Autriche, Pronomade(s) en Haute-Garonne – Centre national des Arts de la rue, The Théâtre Mercat de les Flors de Barcelona, Le Théâtre Firmin Gémier/La Piscine, a stage under convention for the circus arts of Antony and Chatenay-Malabry, La Verrerie d’Alès en Cévennes – Pôle Cirque Région Languedoc-Roussillon, Le Prato – Théâtre international de quartier de Lille/Le plôt Lille-Tournai, Circ -Crac Centre de recerca de les arts del circ – Catalunya, Le Théâtre de la Coupe d’Or, stage conventionnée de Rochefort, L’Usine – Lieu conventionné dédié aux arts de la rue, Le Carré Magique, scène conventionnée de Lannion-Trégor, El Canal -Centre d’arts escèniques de Salt-Girona, la CCAS, Caisse Centrale des Activités Sociales du personnel des Industries Electrique et Gazière. 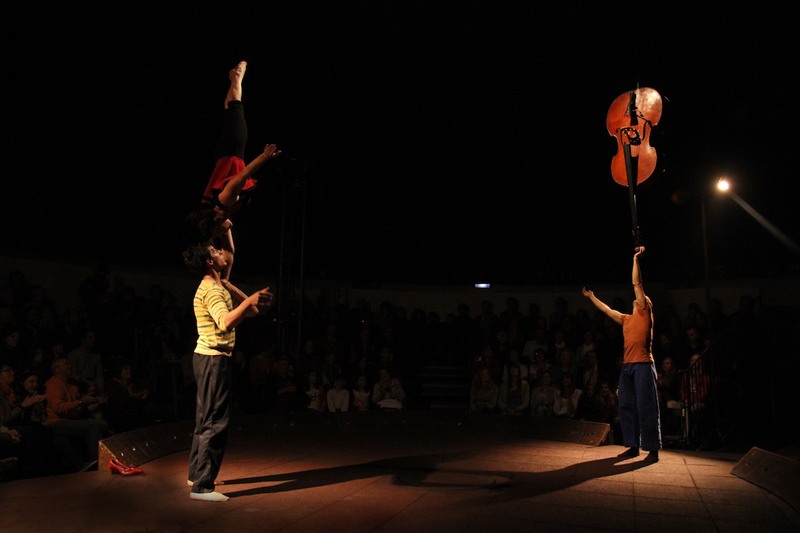 WITH HELP from the Ministry of Culture and Communication DMDTS/ DRAC Midi-Pyrénées, the Midi-Pyrénées Regional Council, the Haute-Garonne General Council and Spedidam.